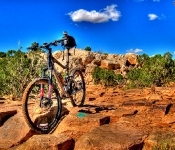 This is the first time I have actually ridden the Sovereign Trail, although I have been to the trailhead twice before, but each time it was too busy for my liking. 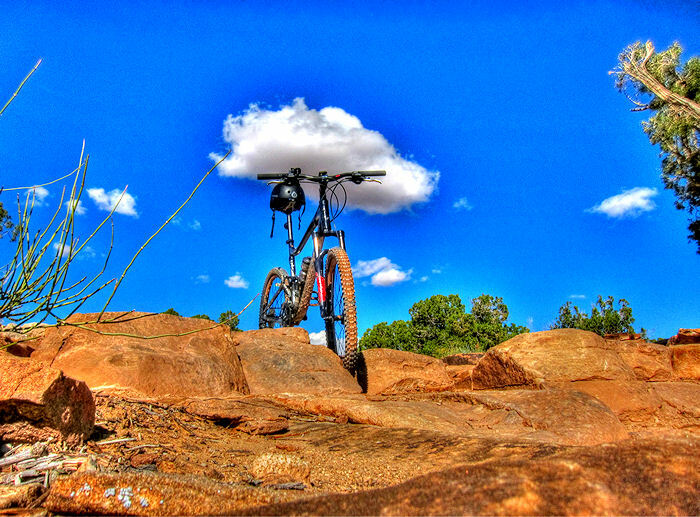 They say the first time is always the best, but in this case I’m not so sure. 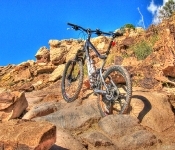 Just minutes from finishing the trail I produced the “Mother of all Endo’s” , Endo’in off a 4 ft legdge and finishing the Sovereign Trail by cracking my Sternum as a souvenir … Luvly Jubly !! 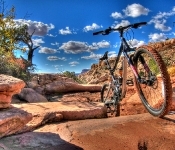 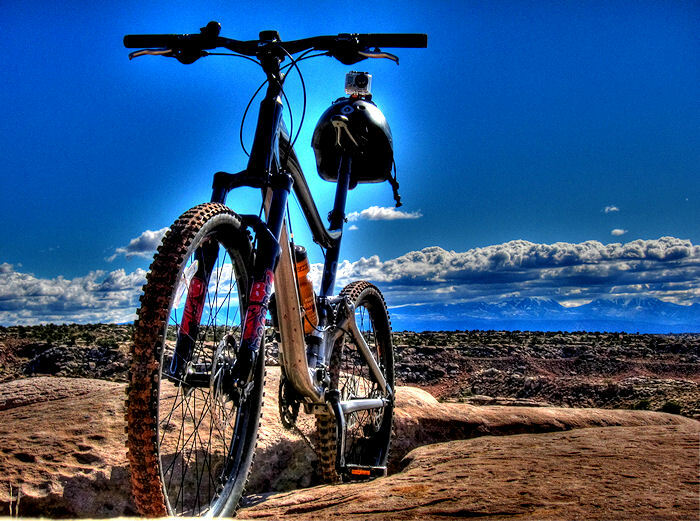 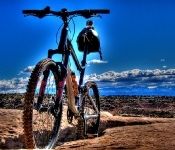 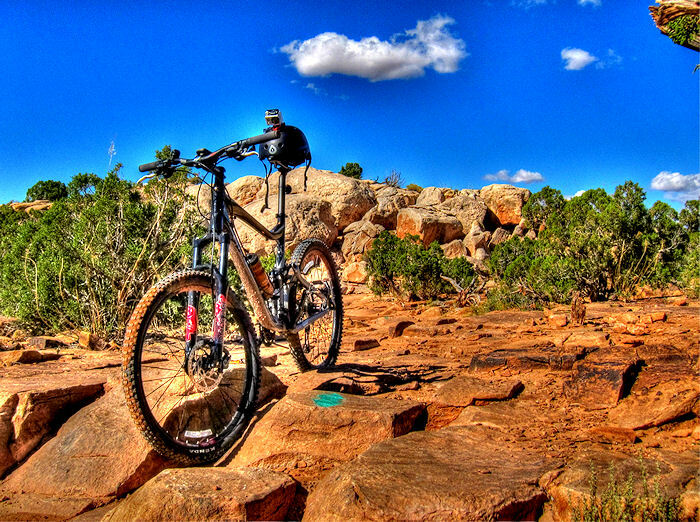 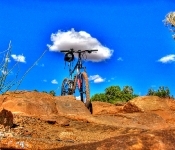 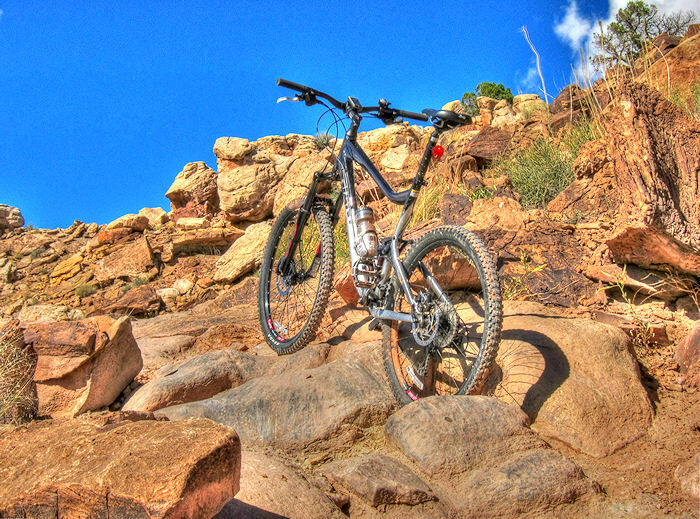 Sovereign is one of the newest mountain biking trail systems in Moab. 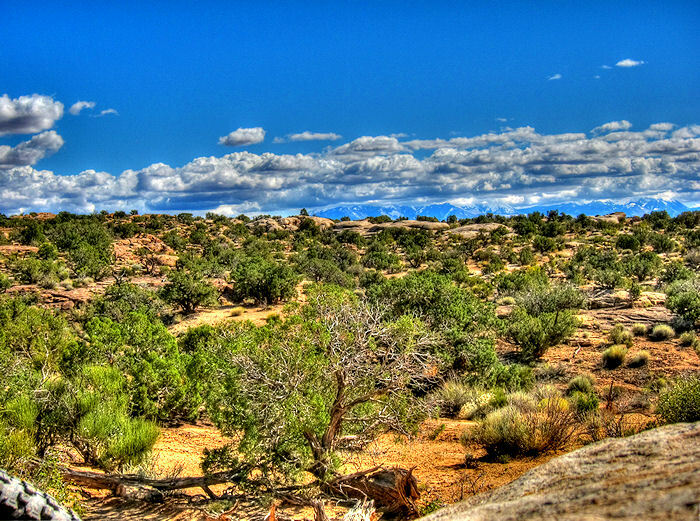 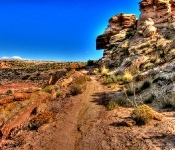 The terrain in and around Sovereign is generally flatter than most of the terrain in the Moab area. 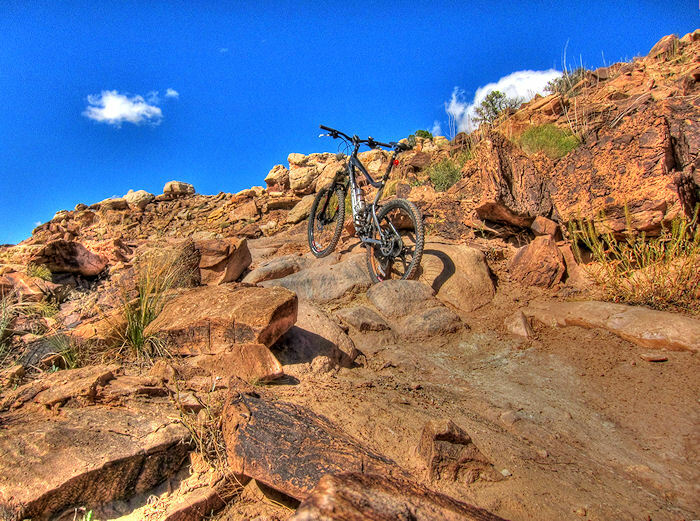 However, don’t let that fool you into thinking this ride won’t be fun or challenging.The Sovereign Trail offers plenty of technical sections as well as rolling fast twisty singletrack sections and some short slickrock sections. 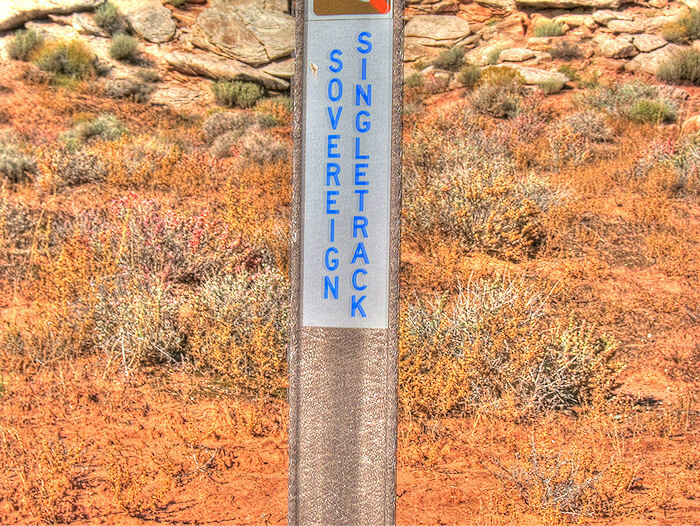 Finding the Trailhead Parking was easier than finding the actual trail, luckily for me, someone else arrived, and they pointed out the general direction. 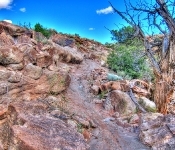 However, once you have actually found the trail, it’s easy to follow, and pretty well marked. 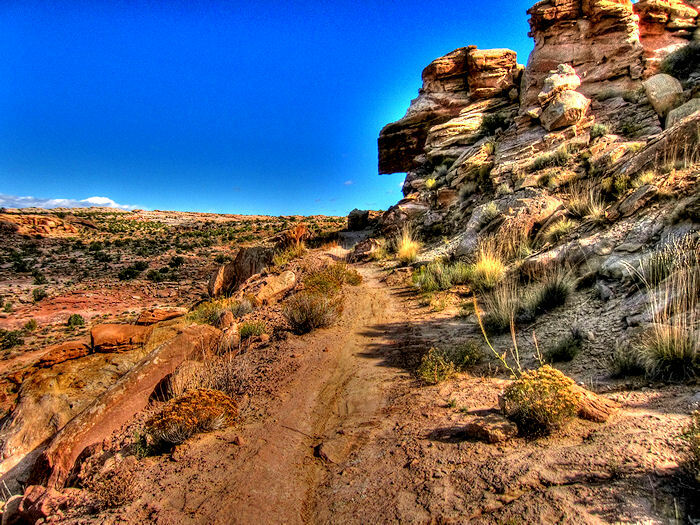 But, be careful, there are loads of various other trails in the Sovereign system. 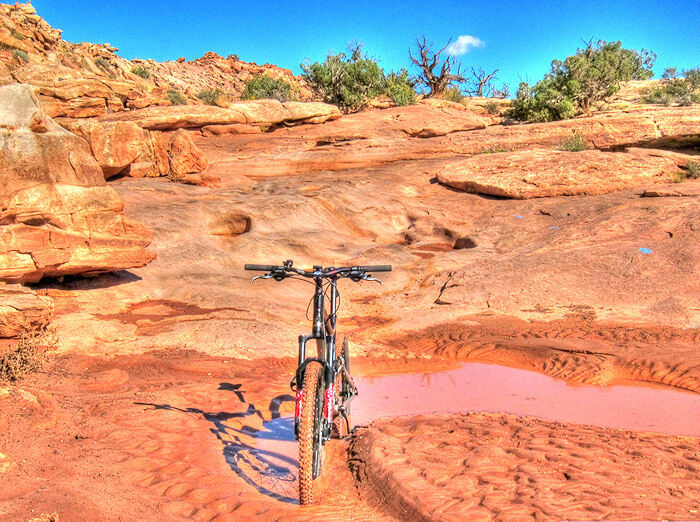 The trail is great, starts off with an easy peddle up a dirt track, and then onto a wash-out that will take you to the first of the slickrock, marked with blue arrows. 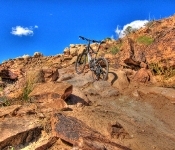 This is a fun technical section, completely manageable if you find the right path. 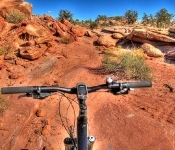 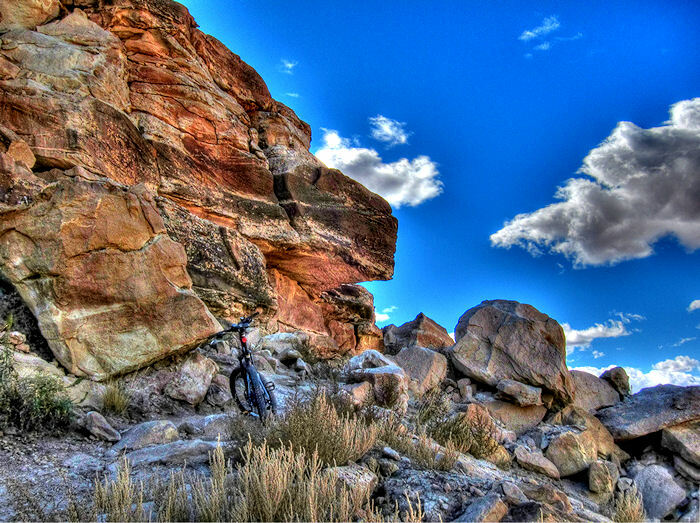 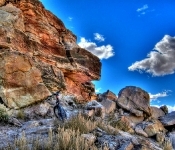 Although there are a few sections that are pretty strenuous, the majority of the trail is pretty easy going, no extreme climbs or drops, however there are plenty of rocky down sections and a couple of very sharp switchbacks with pretty brutal drop-offs if you over-ride them to put a permanent end to your fun ride. 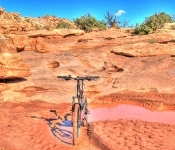 If I had been blindfolded and dropped on this trail, I would have thought that I was in Fruita or Grand Junction, it did not have the usual Moab feeling like most other Moab rides have. 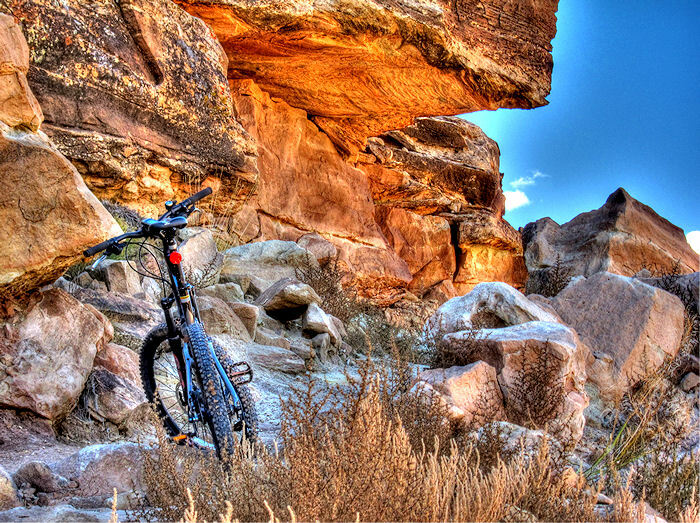 This is not a bad thing, ‘cos I happen to love the Fruita trails. 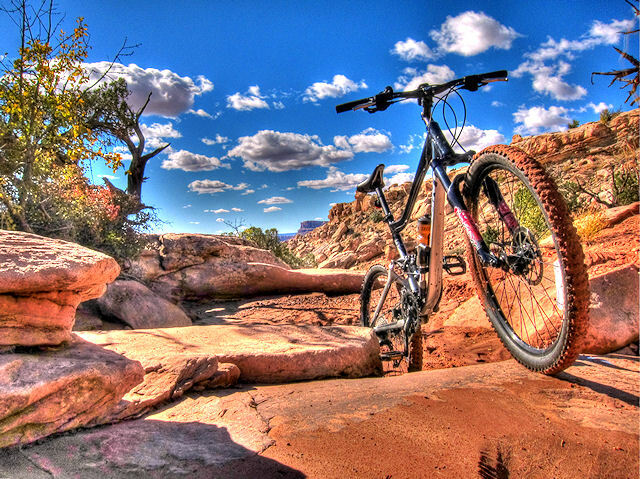 The Sovereign Trail offers just enough of everything to make it a fun and exciting ride. 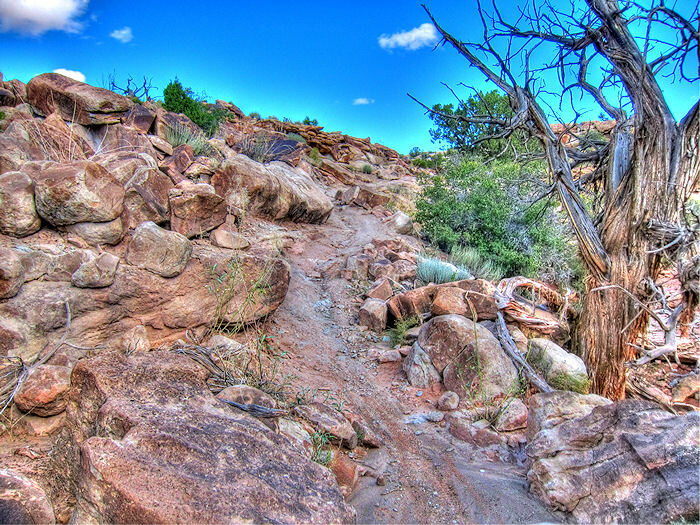 The trail is not too technical, or strenuous, but it’s not a walk either. 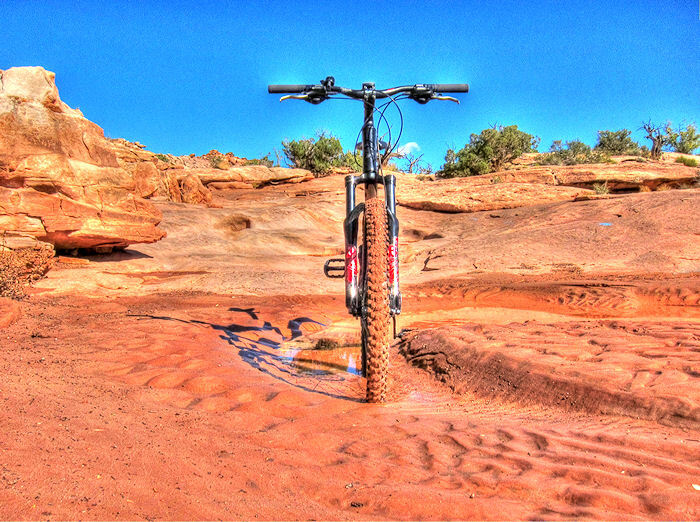 All in all the Sovereign trail is an absolute “must do” for anyone planning a list of Moab rides. 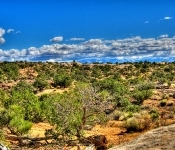 Getting There : Willow Springs Road Trailhead: On US-191 north of Moab, turn east on dirt Willow Springs Road. 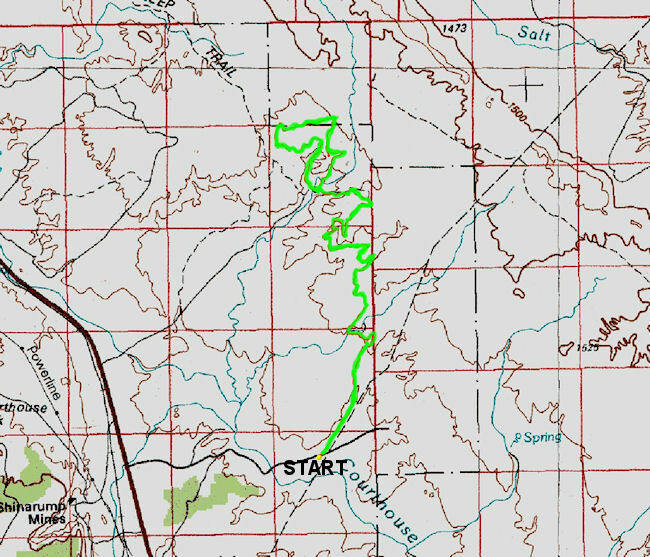 Keep L at fork at mile 1.3. 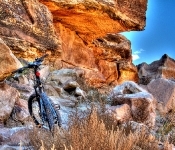 At mile 2.0, park in the rock-outlined area on your left N 38° 41.876′ W 109° 39.868′, just before a natural gas pump building on the R. Start the ride by continuing down Willow Springs Rd. 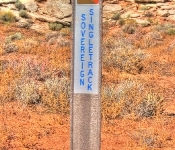 The Sovereign Trail is just a 15 min. 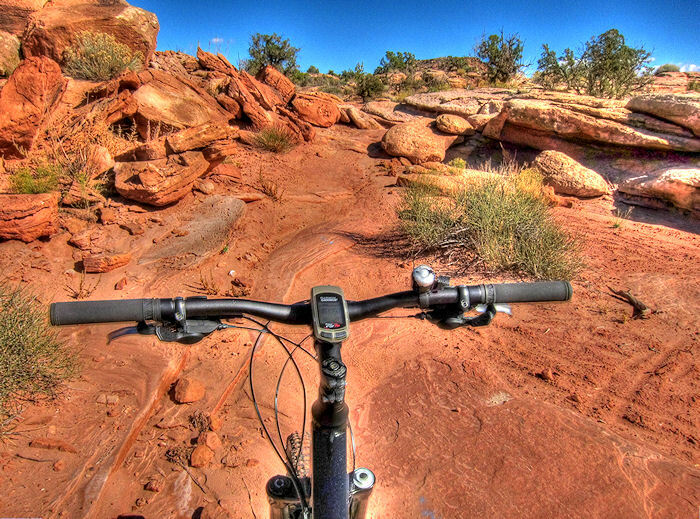 drive from your campsite. 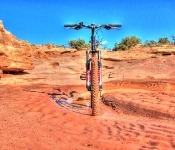 Just did this trail Friday on day 1 of my inagural Moab trip, thanks for the ride recap, makes me want to be back…heal up!